1 of 6 In small bowl, blend honey, teriyaki, vinegar, scallions and garlic; divide in half and set aside. 2 of 6 Adjust top oven rack so that it is 6 inches from heating element and heat broiler. Line a rimmed baking sheet with aluminum foil. 3 of 6 Heat a large nonstick skillet over medium-high heat; toast almonds for 6 minutes. Remove almonds; carefully wipe out skillet. 4 of 6 Place 1/4 cup water in skillet; reduce heat to medium-low. Add broccoli and cook, covered, for 7 to 8 minutes or until bright green and tender. 5 of 6 Place salmon on prepared baking sheet; brush with half of the reserved teriyaki mixture. Broil salmon 5 to 8 minutes or until top is browned and the interior temperature registers 120 degrees F on an instant-read thermometer. 6 of 6 Stir cornstarch into remaining reserved teriyaki mixture and pour into skillet. Bring to a simmer and cook, stirring, for 4 minutes or until sauce has reduced to a thick glaze. 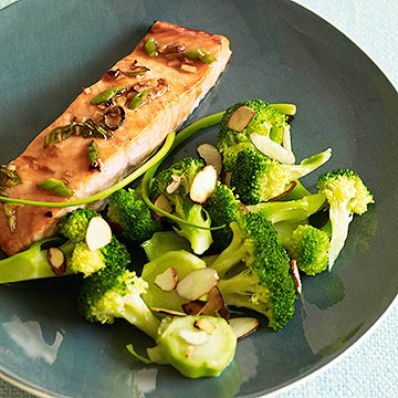 Stir in almonds and serve alongside salmon. Per Serving: 30 g pro., 25 g carb., 14 g Fat, total, 62 mg chol., 2 g sat. fat, 6 g fiber, 239 mg sodium, 332 kcal cal.